Well that's us back from the Schlager event of the year and we had a great time! SVT certainly know how to put on a show! The atmosphere was electric in Globen for the final of this years Melodifestivalen. The only disappointing thing for us is how totally predictable the results are every year. While in Stockholm we managed to catch up with Sanna Nielsen (thank you Lotta), she was very nice to us and we managed a little photot oppertunity. 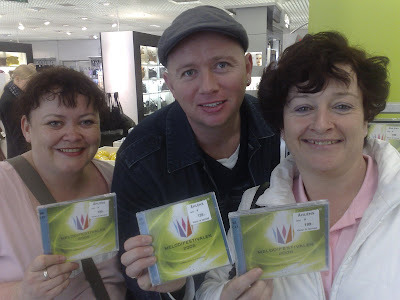 Sanna was appearing with Amy Diamond at Globen shopping centre signing their new CD's. Sanna's manager Lotta told us her new CD will be out in April and will be called 'Stronger' and that she feels that the title reflects Sanna's strenthened personalitly, which is a view also shared by Anna Book, as she told us on Friday afternoon. Anna was at the Friday and Saturday evening shows and was there in her capacity as TV presenter for a talk show on the Telia TV channel where she gets to interview her schlager friends. Thanks to Torbjörn Ek from Aftonbladets's Schlagerblog for taking the photo for us together with Sanna. We chatted schlager with Torbjörn for a while while Sanna was signing copies of 'Empty Room' and he featured a little story and picture of us with Sanna on his blogsite http://blogg.aftonbladet.se/7/perma/764561/. We hung around the shopping centre for a little longer as we were keen to see this years, at the time winner in waiting, Charlotte Perrelli. Charlotte was very nice, we thanked her for the interview she gave us last year and she gave us a big kiss in return! Marty receiving his Degree in Schlager from Professor Perrelli! We headed back to Globen for the Saturday Genrep of MF08 but stopped off on way to catch Alcazar's live appearance outside McDonald's. The group sang Not a Sinner, Not a Saint, Alcastar and their new single We Keep on Rockin'! They sounded great! Kethan shot some footage. Later that night we headed back out for the final and below is a few pic of us from Globen! Below is our first feature film caputring the excitement of Stockholm and Melodifestivalen. Filmed entirely on location and no expense was spared in the making of this film so sit back, relax and have a laugh at our 'Road to Globen'. So you can go to India but you cannot get to London, was it a missed notice on your website about the last Schlager Party & no mention of the Eurovison Party your supposed to follow Schlager or are you just hanging on hoping to be noticed mind you having said that you appeared to be drunk on arrival at the last Schlager party & your video footage you did at the Melodifestivalen was all about yourselves trying to be clever but drunk. Your Miss Tempus is on the other hand very professional, when I asked her if she wanted a drink at the last Party she said no she was taking photos, the Schlagerboys and the Melodiman never appear drunk either - strange that. The Schlager Systems will not comment on such rubbish posted here. From now on all comments will be moderated.... got it!